In today’s business world, much of our communication and collaboration is done through the Internet. With so many online video conferencing options, more than ever it’s important to choose one that is dependable, reliable and, most importantly, easy to use for both you and your participants. While there are some with a variety of features, we cannot deny that screen sharing is one of the most helpful tool when hosting a meeting, and can be a life-saver in many situations. At FreeConference.com, our screen-sharing feature is 100% free, and no download required. Screen Sharing is a lifesaver! Screen sharing can totally get you out of any pickle! Tried hosting an engineering meeting with a plethora of documents and diagrams to peruse? Sending your participants a mass of documents to dive through can be time consuming and frustrating. With screensharing, the host can pre-select just the relevant document so that everyone’s on the same page. There may be times when you’ll want to draw attention to a specific part of your PowerPoint, for example, without having to say “try looking in the upper-left of your screen. Instead, our screen sharing feature integrates flawlessly with PowerPoint’s annotation tools, so that you can easily indicate the spot to which your guests should focus. Like a spy trying to share a top secret document, FreeConference.com allows you to control exactly what you want to display: Our screensharing function gives you the option to select any window currently opened on your desktop, allowing you to share only what you want everything to see, and providing the ultimate in security for your session. The first time you use our screensharing feature, you’ll be prompted to install a Chrome extension, the addition of which is all you’ll need! 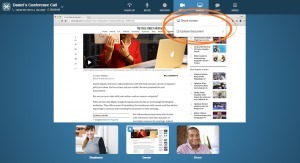 On your Online Meeting Room, click on the “Share” icon located on the toolbar at the top and select “Share Screen”. From the pop-up window, you can select what to share with your participants: Your entire desktop, a program, or a document that you had opened. As the Presenter, you control exactly what and how much you wish to share during the conference. Our screen-sharing function is free and incredibly user-friendly. Why not give it a try for your next online meeting? It can certainly save you a lot of trouble if you’re in a tight spot.